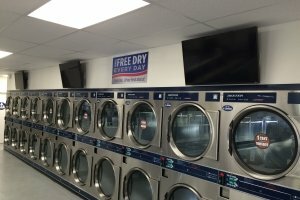 After many years without a new state of the art Laundromat, and a void of existing quality Laundromats, the people of San Marcos finally have a first rate, million dollar Laundromat in their community! Opening a brand new Laundromat in North County, or anywhere in San Diego for that matter, is no easy or inexpensive endeavor. Due to water conservation efforts and the high cost for sewer connection fees most operator’s shy away from building new facilities. 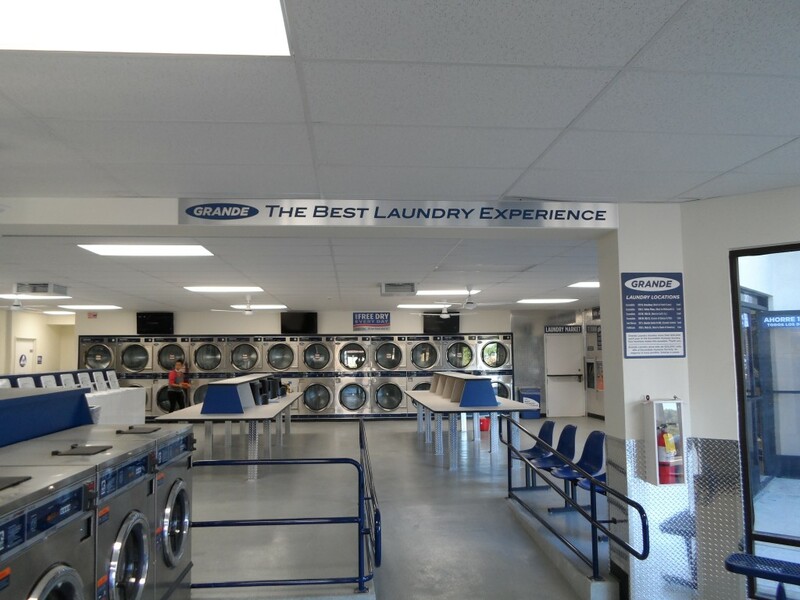 Grande Laundry Place bucked the trend and has turned out a state of the art, 4,000 square foot, energy efficient, “Express” Laundromat just south of Highway 78 on South Rancho Santa Fe Road. Grande Laundry Place owner, Ross G. Rose, is a long time local resident of Escondido and grew up in Fallbrook attending Fallbrook High School. He hasn’t gone far and doesn’t want to. He is a true local businessman and Escondido supporter. Ross has a particular interest in the well being of animals and Grande Laundry contributes over $25,000 per year to the Escondido Humane Society. 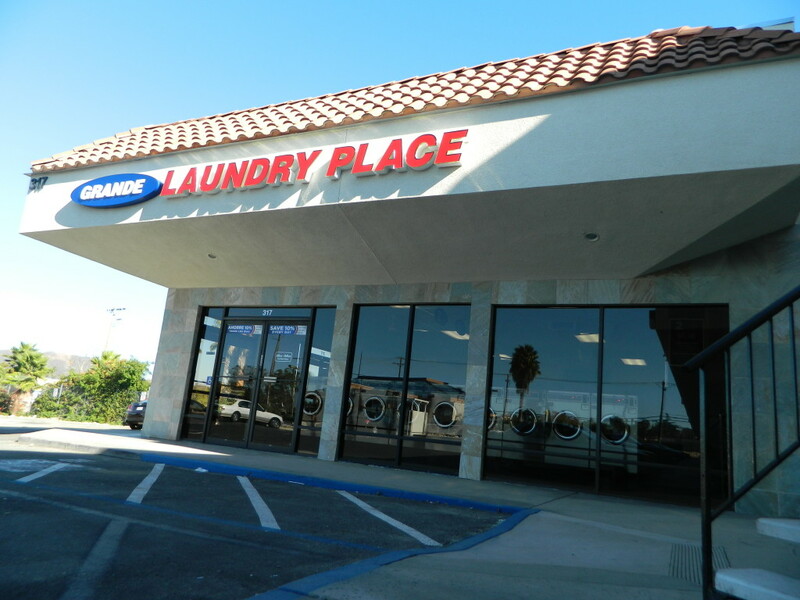 Grande is the premier Laundromat operator in Escondido. Prior to the new store in San Marcos, Grande had five stores. Until now the Fallbrook store was the only one outside of Escondido. Grande prefers to keep their operation local and close to the home office in Escondido. This allows them to keep a close eye on quality and able to react quickly to customer needs and requests. Ross built his first store 26 years ago, and 16 years ago bought an existing store in which he installed new Dexter equipment. “I am simply amazed at how well the Dexter’s still look and perform. Four of our stores have another brand that are six years old and break down more often than the 16 year old Dexter’s. The old Dexter’s look better than the other brand that is only six year old!” says Ross. In 2007 and 2008 Ross built or bought and refurbished the other four stores. He chose another brand not realizing that all laundry equipment is not manufactured with the same quality standards in mind. Now after many years of Laundromat ownership he has seen first hand, the differences between Dexter and other brands of coin operated laundry equipment. In addition to the durability and good looks of Dexter equipment Ross notes that the Dexter store consistently uses 30% less water per dollar of revenue than his other non Dexter stores! He uses 6.5 gallons per dollar of revenue with the Dexter’s and 9.5 gallons per dollar of revenue with the other equipment. He discovered that the long term value of machinery that will be in service for 15 or more years is much more important than saving a few dollars at the time of the initial purchase. Like most things, for example a car or a home, the quality of the design, materials, and craftsmanship that the manufacturer employs has a great bearing on the longevity, performance, durability and appearance of the product. Dexter has been manufacturing quality laundry equipment for over 100 years. It is an American, employee owned company based in Fairfield, Iowa. Choosing the Dexter “Express” washer enabled Ross to help achieve his goal of a more environmentally friendly business. First, the “Express” model uses less water than other washers. The “Express” washer also spins at a higher speed during the spin (or extract) cycle which removes more water from the laundered goods. Less water in the laundry coming out of the wash cycle means shorter drying time which saves both natural gas and time and money for the customer. Residents in San Marcos will find other attractive features in Grande Laundry Place. Instead of using coins Grande uses a Loyalty Card System so carrying around a bag full of coins is a thing of the past. This is especially helpful on the larger machines where in some cases customers would have to deposit up to 30 coins. On top of the convenience when the customer purchases $20 worth of credit they get an additional $2 added to their loyalty card. Grande Laundry Place also has drying specials on Thursday’s where the dryers cost as low as 1 cent per minute of drying time. You will also find the layout of the Laundromat is well planned. Essentially there are two rooms; one for wash and one for dry. The area for drying has loads of space and folding tables. They also spared no expense on the improvements to the space. You will find an up to date and cool interior design that is very pleasing to the eye! Making the customers feel at home is the goal at Grande! If your timing is right you may receive a gift card for a pizza. Free donuts or pizza right then and there is also a possibility. Lastly you will find easy access to the Shopping center on South Rancho Santa Fe Road and La Mirada. It is accessible from both directions and has plenty of parking. Amazingly enough, after all of these years, Laundromat operators tend to put little thought or substantial investment into their businesses. Amazing in that Laundromat users are like any other patron desiring great customer service, a pleasant and clean environment, a good product and to be valued as a customer. You will find all of this and more at Grande Laundry Place in San Marcos!